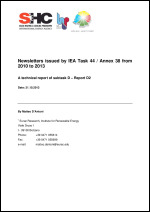 This reports gathers the 3 Newsletters issued by Task 44 / Annex 38. Over the past few years, systems that combine solar thermal technology and heat pumps have been marketed to heat houses and produce domestic hot water. This new combination of technologies is a welcome advancement, but standards and norms are still required for its long term successful commercialization. Such combinations are complex and need more control strategies and electronics than separate configurations. Therefore the optimisation of the combination is more complex and the cost effectiveness of the combination is not obvious. 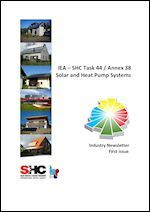 This newsletter presents the effort made in classifying Solar and Heat Pumps systems made by Task 44 / Annex 38. A uniform SHP system representation has been presented and a guide line in developing it is shown. This energy flow chart can be applied to any other space heating or DHW generation systems and a direct comparison can be derived. Finally, the framework for the performance figure calculation is presented. This newsletter presents the status of the work of the SHC Task 44 / HPP Annex 38 or T44A38 work. The solar industry and the heat pump industry are the primary targets. The content reflects the activities along the course of the work and not necessarily the final conclusions that will be published in all deliverables at the end of the work duration (December 2013).